Hi, I am interested in your 1954 Dodge Other Dodge Models listed on Autotrader for $50,000. I'd like to get more information about this vehicle and confirm its availability. 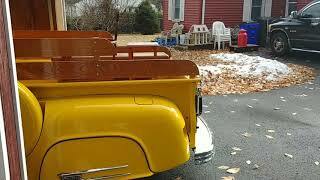 Fully restored 1954 Dodge Pickup. With 502 Chevy motor. Custom grill bumpers tail lights. Oakwood bed. Shaved door handles custom hood many custom parts it's a must-see. Spent $100,000 to restore. $50,000 cash or bankers check. Owner wants to sell has arthritis getting harder to drive a manuel.